Pure retro gold -- that's what I'm about to show you within the pages of this awesome scanned book I found on Flickr, Sunset Ideas for Clothing Decoration. 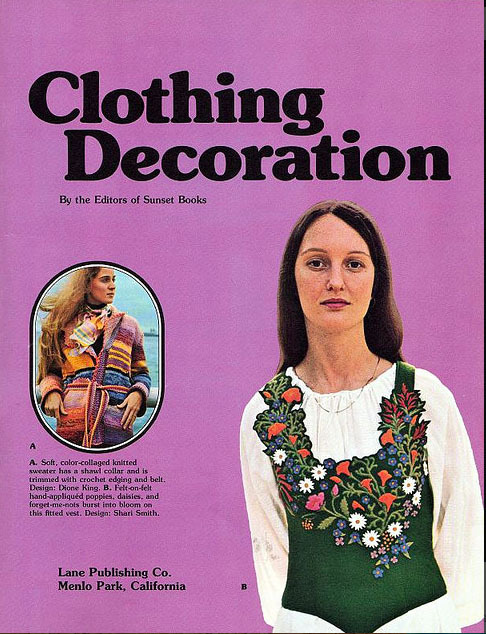 This book was published in 1977 and amazingly, you can currently buy a copy of it on Amazon.com with a description that says it was "rarely opened." That's a shame, because a book like this was meant to be enjoyed and poked fun at on a regular basis. You want to keep scrolling because things go from groovy to grotesque in a heartbeat. 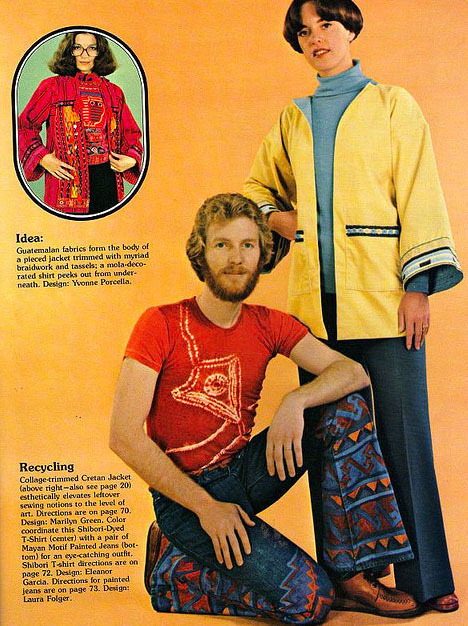 I don't think there's any further introduction I can give it before we delve in other then announcing, "Ladies and gentlemen, welcome to the 1970s." I'll admit it -- the Polish girl in me really digs this vest; it has an Eastern European look to it. I don't think we can say the same for the model; I've seen happier women in laxative advertisements. I do like this skirt, too. 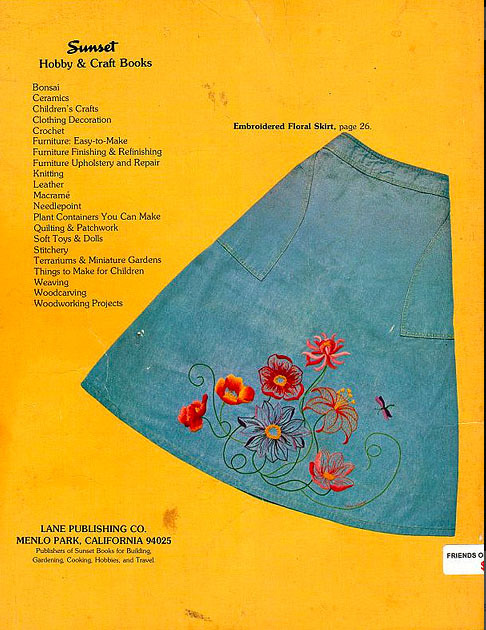 A few years ago I started embroidering flowers on an old pair of jeans; I'll admit seeing this is inspiring me again. Very Bohemian. 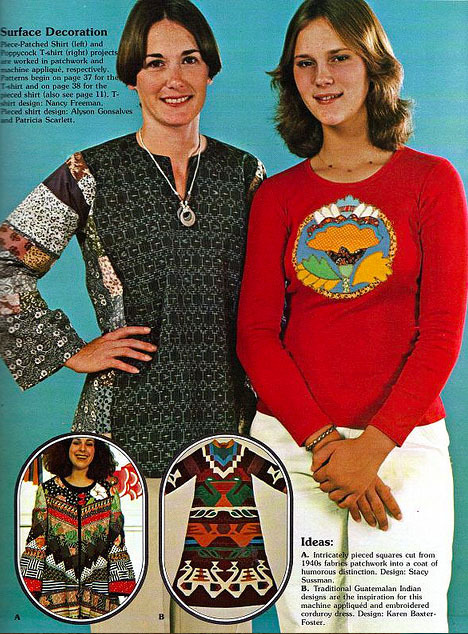 Not sure what I think about the eagle on the back of the sweater but this was the 1970s, after all. The purple flowers in her hair is a nice matching touch. I honestly can't tell if the top model is a boy or a girl but either way, that is the worst looking bowl haircut I've ever seen. 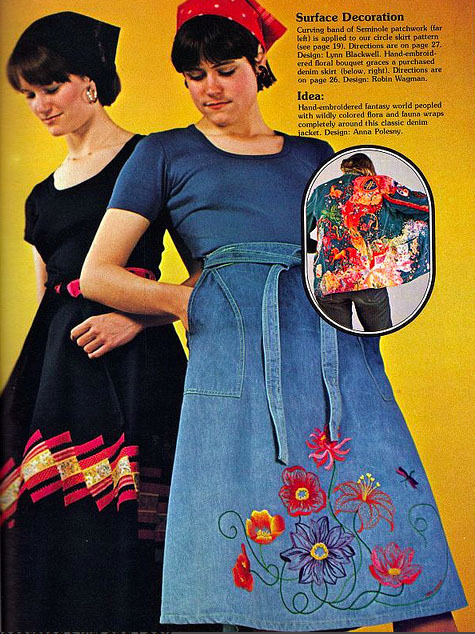 Thumbs up on the dress and that embroidered denim skirt again. 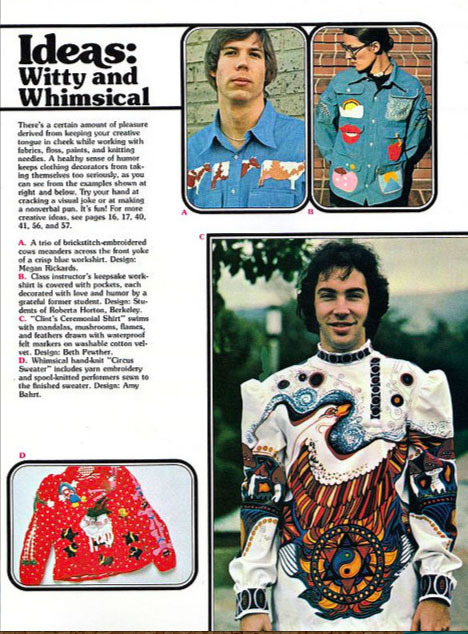 Not sure what I think about Joseph's amazing technicolor dream coat at the top, though. And now we're starting to get a little weird. 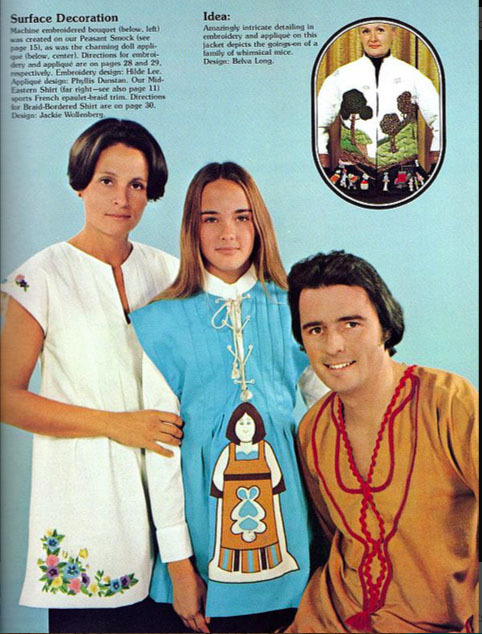 The girl has an image of a rather rotund lady appliquéd on a smock, while dad looks like his shirt is trimmed with macrame. 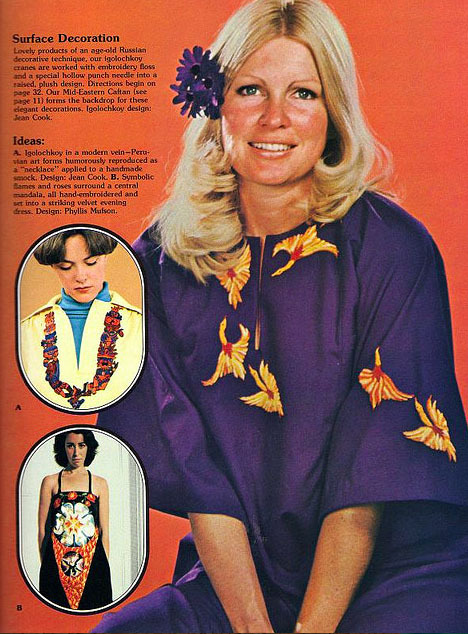 The tunic on the "mom" is the only fashion statement I'd approve here. Was that previous page not weird enough for you? Well then, here you go. I still haven't figured out what we're supposed to be looking at here. It's a little scary. 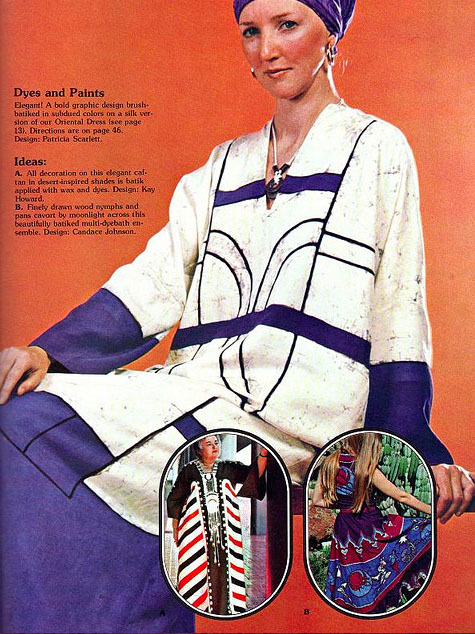 South American inspired duds and patchwork. Back to more over-the-top weirdness. A quilted coat from this decade wouldn't be complete without a rainbow somewhere on it. I honestly can't think of anything to say. Let's keep going. 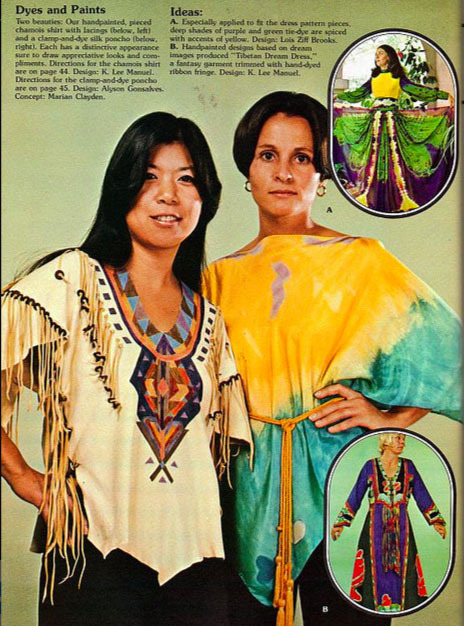 Tie dye and Native American influences...now we're talking! 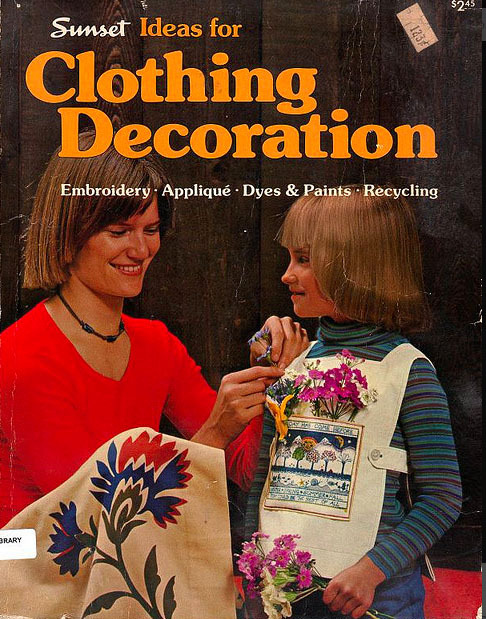 That's right, why should only the women be humiliated in this craft book? Oh boy. 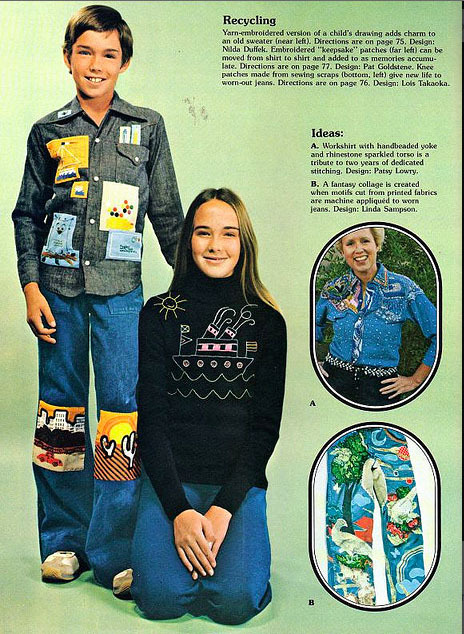 I hope someone told the dude in the cow shirt with the dour expression up top how lucky he was that he at least didn't have to model the outfit on the bottom. 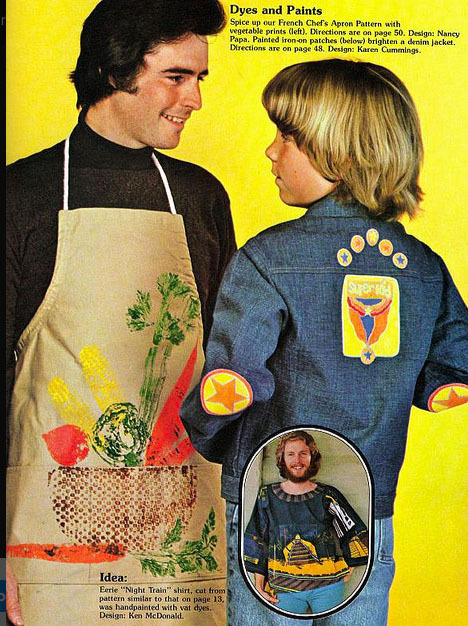 I appreciate that the boy's shirt is made of recycled...er..."keepsake patches". But sending your child off to school looking like this is just begging for them to be beaten up. It takes a confident man to wear painted jeans. 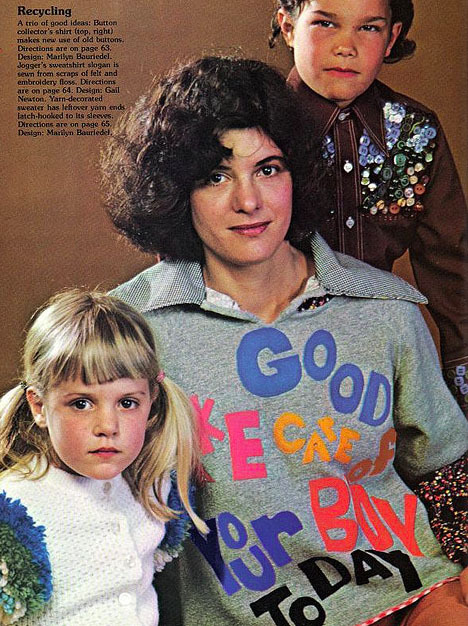 And we've finally reached the end, which is good news because the sentence on her top makes no sense (much like half of this book)..."Good take care of your boy today." Huh? Oh dear lord! Commune living at its worst! By the end of this they're all drifted into cult territory! 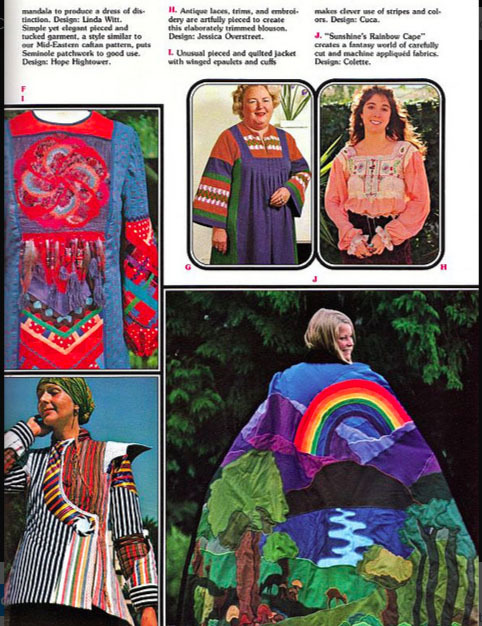 It's like a quilter threw up on all the clothes! 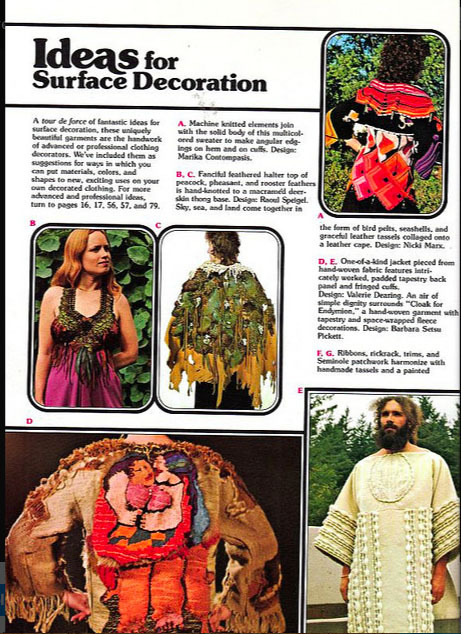 I think the model on page 8 with the bad bowl cut is the same woman in the white tunic two pages below, the black and patchy tunic, the yellow and aqua tye-dye and the last yellow jacket. Poor thing. But I feel sorriest for...well actually everyone here! 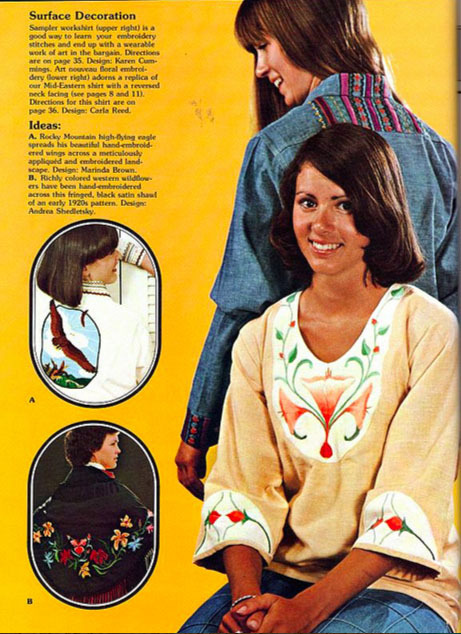 But the guy in the white, puffy-sleeved eagle/Russian trim tunic probably thought it was an audition for The Eagles or something... Maybe someone saw this when it came out and had a brainstorm to make the first ugly Christmas sweater! You should send a link of this to Tom & Lorenzo; they'd die! Plaid Stallions would love it too! Ha ha, Therese! Too funny.